Chinese Calligraphy - What's going on in Mr. Solarz' Class? 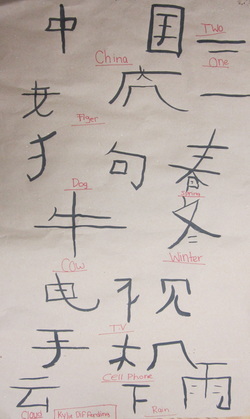 Our class spent some time learning the Chinese characters for various common words. We chose some that we liked and decided to draw them using brushes and ink! This is Kylie's poster. She chose words such as "Tiger," "Dog," "Winter," etc. She also wrote the symbol for "China" at the top of the poster.